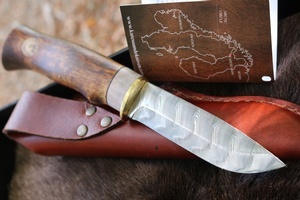 Karesuando Damascus 160 layer Northern Lights Knife. These stunning knives are made in very limited number by the Lapp Swedish firm of Karesuando. The steel is the 'Super steel' RWL34 and the beautiful Northen light pattern is created with 120-160 layers. 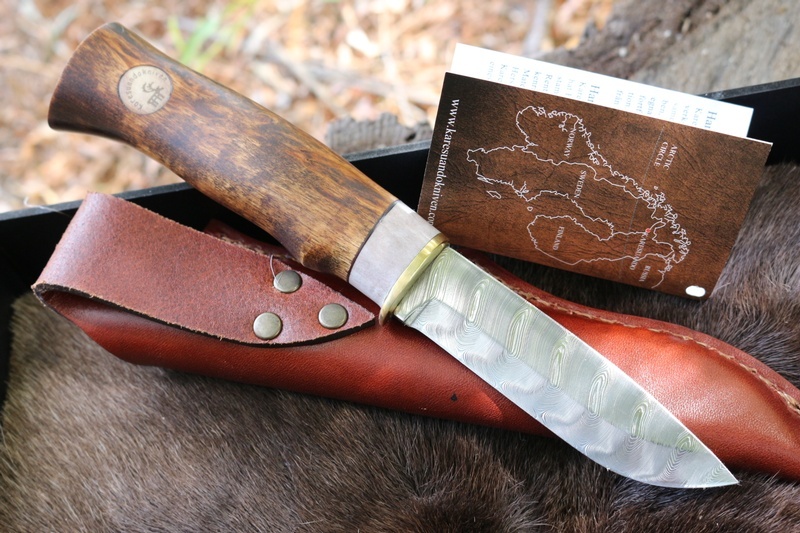 This is a superb knife offering outstanding blade performance and beautiful lines. OAL 8.5in, blade 3 7/8th, 3mm thick. RWL34 160 layer damascus steel, scandi grind. 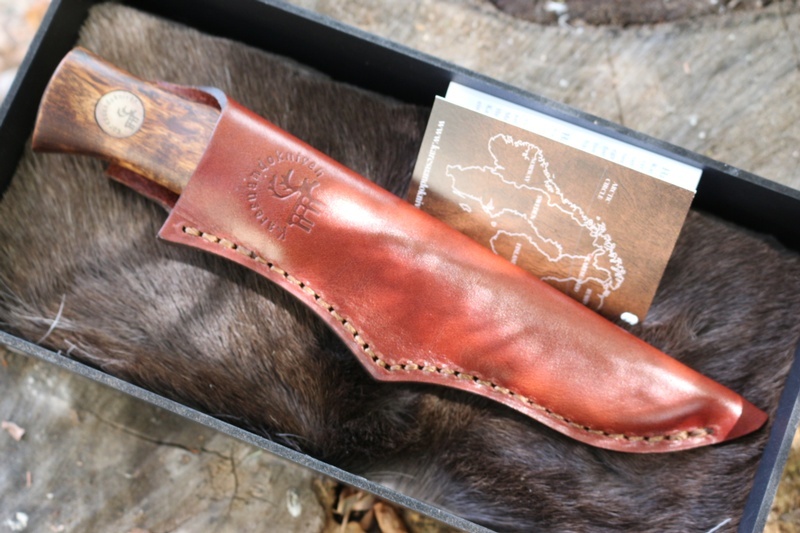 Handle curly birch and moose bone, sheath is friction fit leather. Comes in presentation box. Our Damascus steel is of highest quality compared to all other Damascus steel in the world. The base of our Damascus is bespoke knife steel Rwl34. Our damascus steel also becomes Stainless when we hardens the steel and heat it exceeding 1080 degrees Celsius. It is the company Damasteel in Sweden who produce the steel blank to us. 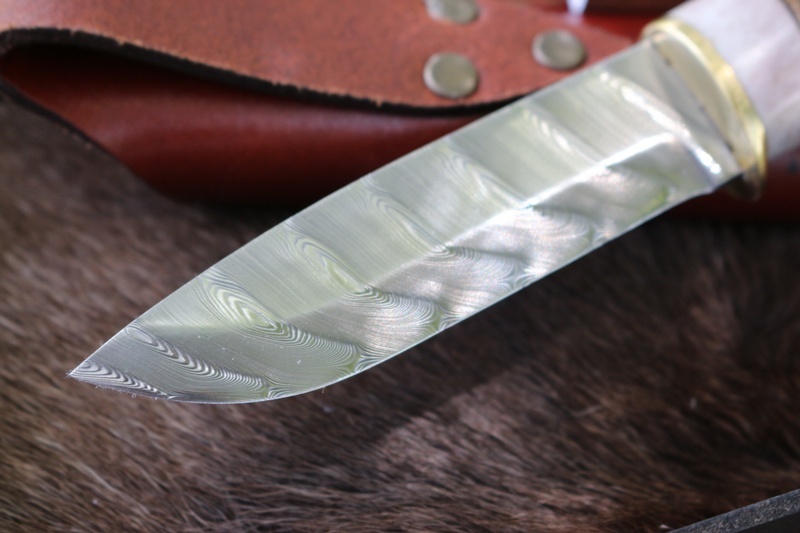 This is a damascus steel that requires a two-ton hammer when it is forged, this also excludes the that a “village blacksmith” can produce such a leaf. Our damascus blade is made ​​to be used, they do not rust-like carbon steel damascus do. 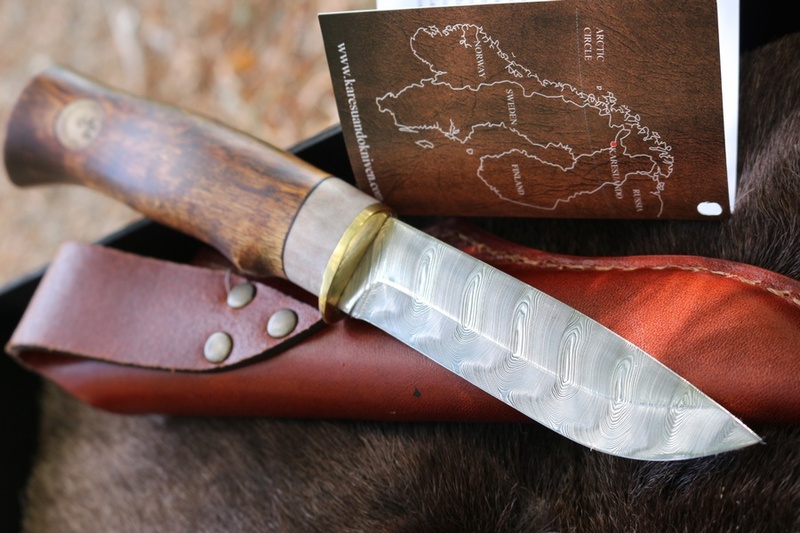 Purchase through PayPal by using the "Add To Cart" button above or use the form below to order the Karesuando Northern Lights 160 Damascus . Feel free to contact us if you have any questions about the Karesuando Northern Lights 160 Damascus .